I modeled the antenna with the AO 9.67 Antenna Optimizer program. 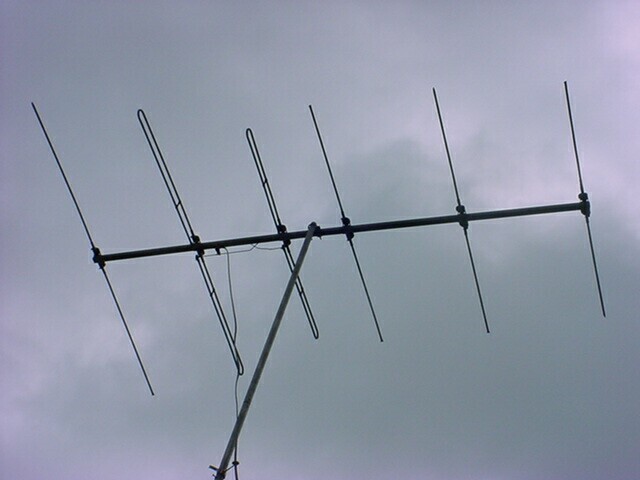 This image shows the antenna geometry. The shorting straps on the driven elements broadband the response. This image shows the segmentation of the driven elements and phasing line. Blue dots mark analysis segments. The red dot is the feedpoint. I found this FM-4 at a garage sale in the early 1970s. I still use it today. An instruction sheet is here. Calculated performance is for 28 analysis segments per conductor halfwave. Forward gain includes mismatch and conductor losses. F/R is the ratio of forward power to that of the worst backlobe in the rear half-plane. bracket model. It extends about 1.5" past the bracket, which I ignored. The FM-4 has two possible mounting holes in the boom for the feed bracket. FM-4 that lacked assembly instructions.